Joyce was born in 1951, on the Indonesian Island of Java, in the village of Surabaya. Her father and mother were of mixed Dutch and Indonesian descent, they are Eurasians. After the Indonesian National Revolution, which followed World War II, her parents, forced to leave independent Indonesia, repatriated to the Netherlands. When Joyce was five, her parents divorced, consequently, she and her younger sister; Ellen were raised by their mother and grandmother. At the age of ten, Joyce’s family immigrated to the United States to chase the American Dream. Her childhood was delightful, growing up in Redwood City; a friendly town located in Northern California’s San Francisco Bay Area. 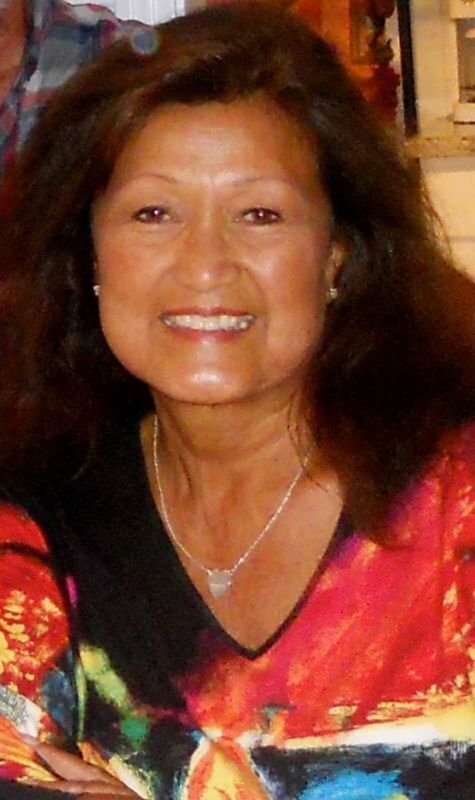 Having journeyed with her family from Southeast Asia to Europe as a baby, before settling on the continent of North America a teenager, Joyce has a penchant for traveling, accordingly it has always been a part of her life. Her first unchaperoned trip, was one year after high school graduation. It felt sensational to spread her wings, discover her own travel style and explore different traditions and cultures at her own pace. At first, her travels were limited to visiting family in the Netherlands, however, as she gained confidence and experience, her adventures included trips to Hawaii, Mexico, Canada, Great Britain and several western European countries. In 1986, Joyce met her Prince. Vincent Joseph Di Lorenzo was the most handsome man she had ever laid eyes on. Vince introduced her to sailing and before long he brought her to the tropical British Virgin Islands on an unforgettable sailing expedition. Almost simultaneously, Joyce fell in love with Vince and their new spirited way of traveling. They were married on October 1, 1988, in the enchanting bayside village of Sausalito. Vince and Joyce made their first trip to Italy in 1990, where Vince discovered his connection to the country of his heritage. They embraced the Italian lifestyle that seemed to grab hold of their hearts. Now they divide their time between their home in San Carlos; an idyllic suburb of San Francisco and their home in Morcella; an enchanting medieval village in Umbria; the Green Heart of Italy. The couple’s sailing adventures continued throughout the years, they have sailed the waters of the South Pacific, the Mediterranean, the Caribbean, the Atlantic and Pacific. Living an adventuresome life, Joyce discovered her passion for writing as she journaled her experiences. She is adept at using her creative flair and imaginative thinking to bring her stories to life, pulling the reader along as they turn the pages. Her books are often rated as one the most popular books of the month on various internet websites. This is a true love story of a Dutch immigrant woman, married to an American man of Italian descent and how they followed their unimaginable dream of buying a vacation home in Italy. 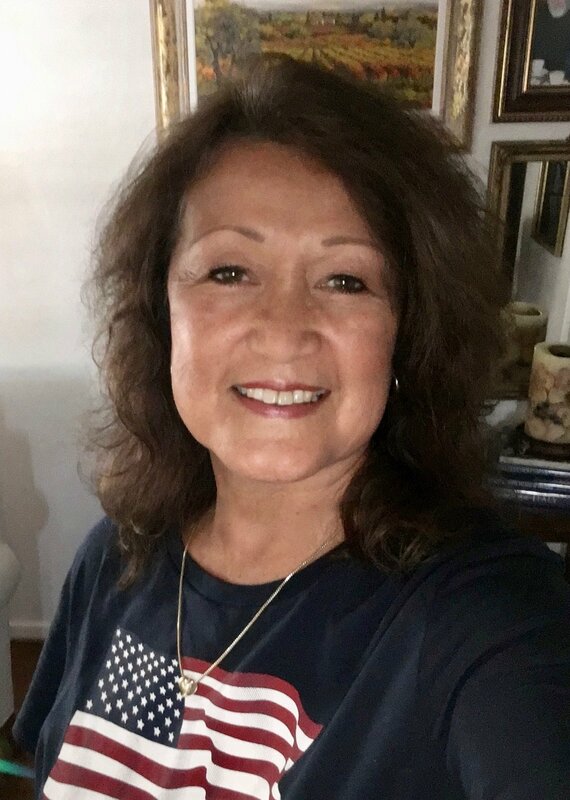 Feeling emotionally drained and sad after my mother died without warning, my loving, insightful husband was my “rock” and supported me through my grief. “You need a project,” he said. “Why don’t you find us a home in Italy?” I couldn’t believe it! He couldn’t be serious, but that inane suggestion was the incentive I needed to veer me from the sadness. Suddenly I had a new and exciting goal on which to focus, dream and talk about. We had visited Italy several times and always enjoyed the time we spent there. Italy is full of those welcoming and engaging Italians who know how to make you feel right at home and with Vince’s Italian heritage, the “ole’ country” was a natural place for us to buy a second home. In our quest to follow our dream to Italian homeownership, we learned a lot about our love and each other. Although many books have been written about acquiring property in Italy, most are about buying a structure to restore into a dwelling. This uniquely different story tells the heartwarming tale of the perils and the wonderful people we encountered during our search to find the perfect home in Morcella; a meticulously well maintained medieval Borgo built in 975AD, in the middle of the country; Italy’s beautiful green belt region of Umbria. Reviewed by Romuald Dzemo for Readers' Favorite. Landing on a Star in Umbria by Joyce Di Lorenzo is an interesting autobiography that follows one woman’s life after a devastating loss as she struggles to give sense and meaning to her existence. After the untimely death of her mother after suffering a stroke, Joyce becomes listless, unfocused, and absorbed by grief. Then one day, her husband, Vince, makes a proposition that takes her off guard and gives her life a new direction: find a home in Italy. In this autobiography, she takes readers on a journey to one of the most exotic places in Italy, Umbria, making them feel the ambiance of the place, its beautiful cuisine, its great architecture, and its rich culture. This is a lovely story that explores an individual’s struggle with loss and how the search for a new home allows her to reconnect with herself and the world, and to heal. Readers will be gripped by the compelling narrative voice, by the author’s gift for storytelling, for capturing details in her narrative without losing sight of the broader picture. The story is emotionally rich and it also offers powerful insights into what it takes to find a new home. I enjoyed the way the individuals come out through this narrative and how the narrator establishes relationships that are essential in the progress of the story. The setting is well captured and it is developed in a way so that readers can easily feel as though they were part of that beautiful world. 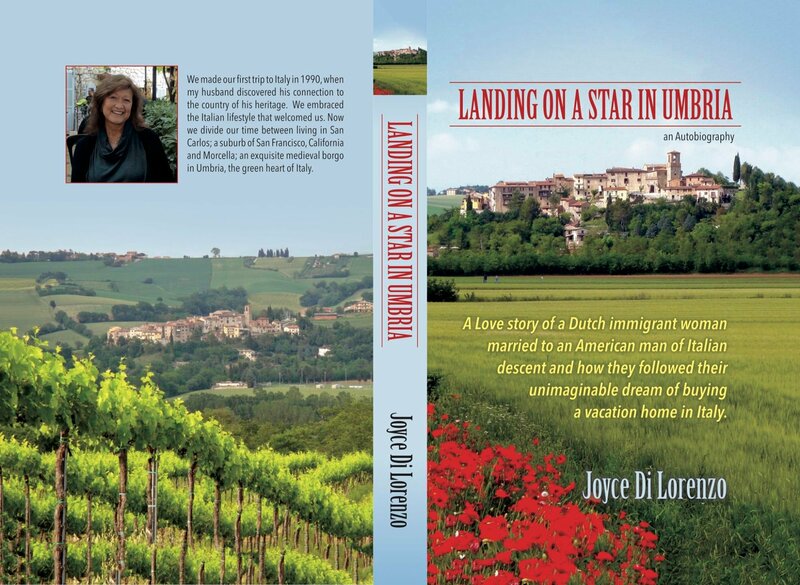 Joyce Di Lorenzo’s writing is impeccable and Landing on a Star in Umbria will both entertain and inform readers. This is the compelling true story of my life as a refugee immigrant child from Indonesia to Holland; a tiny country on the continent of Europe and ultimately to the United States; a world power country on the continent of North America. It is the story of our search for a better life, as told by my loving mother and grandmother while I was growing up and as I remember living it with my younger sister. Although the dates sometimes may not be historically accurate, the experiences are true and consequently, the deep emotion with which I composed each chapter is genuine and gut wrenchingly heartfelt. The story begins with my grandmother who was born to Muslim parents on May 1, 1910, in Banjuwangi; a port city located near the Bali Strait on Java; the fourth largest island of Indonesia, the heart of the nation. Boasting a dazzling array of bewitching landscapes, magical archaeological sites, iridescent rice paddies, smoking volcanoes and rainforests, it is an island of mesmerizing natural beauty with profound traditions in art, music, dance, and cuisine. My grandmother was at a young age when her parents divorced and her mother re-married a Christian man who adopted her. The family moved to the tropical jungle island of Borneo; the third largest island in the world, where the pace of life was relaxed and natural. At the age of sixteen, my grandmother married my grandfather, they bore three children. Their oldest daughter was born in September 1927, in Singkawang; known as the “City of a Thousand Temples” for the many temples found in the city and it’s surroundings. After the birth of their daughter, the family returned to Java, where my mother was born in the city of Banjuwangi, in April 1929, followed by the birth of my uncle, two years later. My father was born in 1924, in the city of Djombang, Java; near the birthplace of my mother. These exceptional Dutch-Indonesian people, made strong by the horrors they survived during Indonesia’s Wars for Independence, made passionate by their optimism and courage to create new beginnings, were the backbone of my family and accordingly, the significant influence of my childhood, which shaped my character as an adult. I was born in January 1951, on the island of Java, in the village of Surabaya. After the Indonesian National Revolution, which followed World War II, my family, forced to leave independent Indonesia, repatriated to the Netherlands. I was a baby when we made the month-long voyage to the Port of Rotterdam on a refugee ship called the Groote Beer; the Great Bear. Throughout my life, I shared my heart and soul with my younger sister; Ellen. From the day she took her first breath, we were kindred spirits. When I was five, my parents divorced, consequently, my sister and I were raised by our mother and grandmother. At the age of ten, our family immigrated to the United States to chase the American Dream. By coincidence, it was also the Groote Beer that crossed the Atlantic Ocean and brought us to New York. I will never forget the day when our ship entered the harbor and we sailed past the Statue of Liberty; the global symbol of hope and freedom. Even in my young life, I knew that when the tugboats safely guided our ship to the harbor; our point of entry into the Land of Opportunity, it was a powerful and emotional moment. My sister and I are their legacy, we are the women we are as a result of my mother and grandmother leading the way on Our Bold Path to Prosperity. 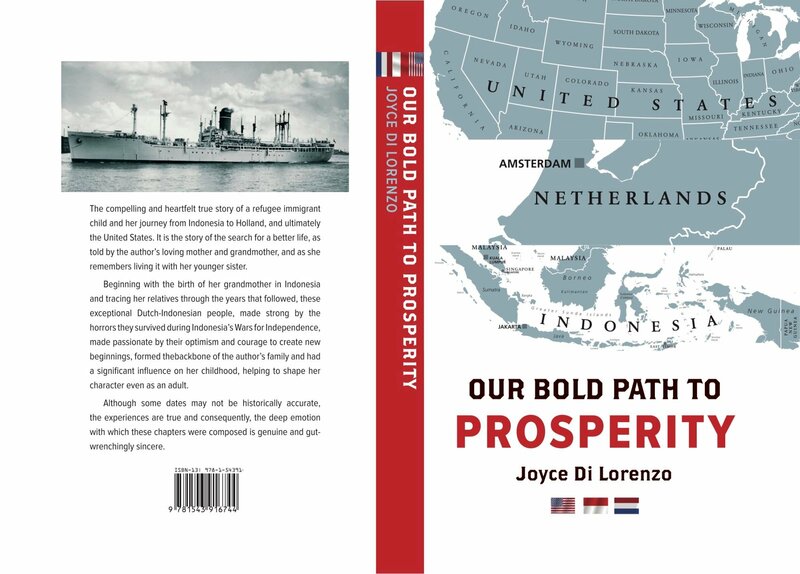 Our Bold Path to Prosperity by Joyce DiLorenzo is a moving autobiography that explores the life of an immigrant and what it means to survive and succeed in foreign lands. The protagonist shares a story that allows readers deep insights into the culture and history of Indonesia following WWII, the challenges of moving to another country, and what it meant to finally settle in the US. Born to Indonesian-Dutch parents, the protagonist’s family moved from Indonesia to Holland just after the Revolution in search of a better lifestyle, but the divorce left the children alone under the care of their mother and grandmother. Follow their story as they move to the United States, pursuing greener pastures and how, through determination and relentless toil, they were able to prosper. This is a gritty autobiography, beautifully written and filled with insightful passages. Readers will encounter strong women in this story, including the grandmother of the protagonist, her mother and her sister. We look at these great women as they deal with life-changing moments, including divorce, immigration challenges, and embracing a new culture. It is also interesting how these women could transform their obstacles into opportunities, taking calculated risks without fear and trusting in life. I enjoyed reading about Joyce DiLorenzo’s mother, a woman who is determined to succeed and who instills in her children the lessons she’s learned herself, teaching them to fight for the things they value. Our Bold Path to Prosperity is told in a very candid and powerful voice and the prose flows gracefully. I enjoyed the author’s gift for description and the ability to create scenes that are deeply emotional, focused, and that grab the reader’s attention. This is a delightful and inspiring tale that shares what it means to be an immigrant. Get in touch with me for more information about my previous publications and upcoming releases.